One of the great honors for every member of Congress is nominating exceptional young men and women to our nation’s service academies. As a retired U.S. Navy Captain, having served 23 years as a Naval Flight Officer and knowing the impact military service had on my life, I take my responsibility to nominate service academy applicants very seriously. Although I did not attend a service academy, I learned the value of combining an education with military service as a student and member of the ROTC program during my time at the Ohio State University. Earlier this week, I was excited to announce my 21 service academy nominees for the class of 2022. These young people represent Delaware’s finest. They’re intelligent, dedicated and exhibit great integrity — they are truly outstanding. It was my privilege to submit their nominations to attend the Air Force Academy, the Merchant Marine Academy, the Military Academy and the Naval Academy. While these individuals are nominated to attend different institutions, they possess many of the same characteristics: good moral character, commendable academic achievement, physical fitness and a desire to lead and, most importantly, to serve. U.S. Naval Academy Midshipman Natalie Sava of Seaford was one of my nominees to the Naval Academy in 2014. She now majors in Ocean Engineering, and is a Squad Leader in the 8th Company. This Sussex Tech High School alumna was recently selected to become a Naval Flight Officer and will head to Pensacola, Florida for flight school this summer. 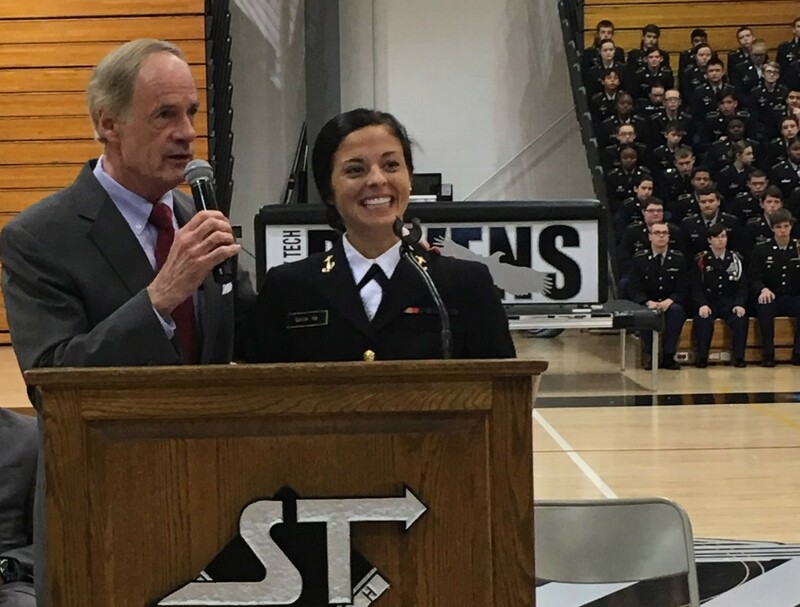 Natalie is a wonderful young woman who looks to give back to her community any chance she can - most recently joining me at her alma mater to educate students on applying to a service academy. I am so proud of our students like Natalie and the hundreds of others I’ve nominated as congressman and senator. They are truly our next generation of leaders. Many of our nominees each year learned about applying to a service academy from attending our annual Service Academy Information Night, held every February. This is one of my favorite nights of the year. Representatives from service academies, as well as the U.S. Coast Guard and Delaware’s congressional delegation offices will be on hand to answer any questions students and parents have about our nation’s service academies or the application and nomination process. 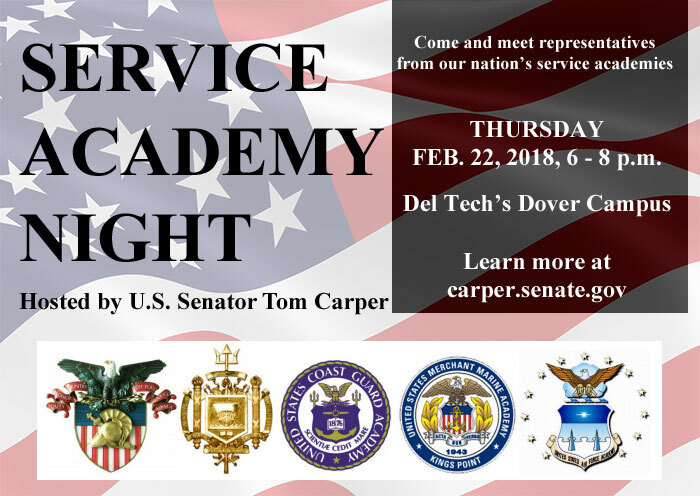 This year, Service Academy Night will be held on Thursday, February 22, 2018, from 6 - 8 p.m. at Delaware Technical Community College’s Terry Campus in Dover. If you or someone you know is interested in attending a service academy, I hope you will join us to learn about the application and nomination process. Obtaining a nomination to our academies is a long and demanding process, but incredibly worth while for those who are called to lead and serve. If you are unable to attend our information session, you can visit my website, carper.senate.gov, or contact Service Academy Coordinator Lauren Mincey at (302)-674-3308 or academy@carper.senate.gov for more information. Take care, God bless and I hope to see many of you at Service Academy Night.